On 8 September 2018, Het Scheepvaartmuseum (The National Maritime Museum) will open the doors to its new exhibition MS Oranje | Changing course, putting the spotlight on the passenger ship Oranje. Today, eighty years after it was launched on 8 September 1938, this iconic ship with an eventful history still inspires awe. The Oranje has a fascinating story, having taken on various roles and guises during its lifetime. It was originally built as a luxurious passenger liner in the late 1930s, sailing between the Dutch East Indies and the Netherlands. It later served as a hospital ship during the Second World War. 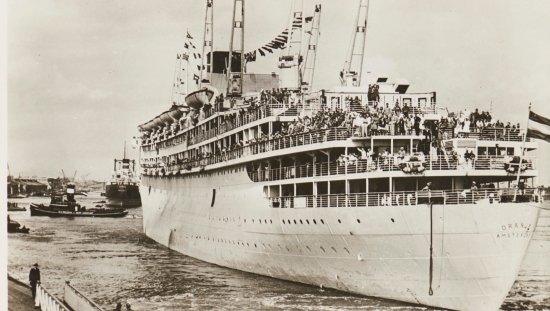 After the war, thousands of people travelled from Indonesia to the Netherlands on board the Oranje, making their way to a new home and a new life in Europe. The twopart exhibition sheds light on both the history of the ship and the personal stories of those postwar migrants. MS Oranje | Changing course is open until 18 July 2019. Few Dutch ships have a story as inspiring and intriguing as the Oranje: the largest, most beautiful, and fastest passenger ship ever built at an Amsterdam shipyard. Its launching by Queen Wilhelmina on 8 September 1938 is a huge event attended by 10,000 invited guests. On 4 September 1939, the Oranje sets off on its maiden voyage as a passenger ship with the allies declaring war on Germany as the Second World War has just begun. This turns out to be its only such voyage for a long time due to the war. Scheduled services between the Netherlands and Dutch East Indies are promptly suspended and the Oranje is forced to change course. The ship is transformed into a floating hospital, bringing injured allied soldiers back home from the front to safety. From 1946 onwards, the Oranje gradually resumes its original role as a passenger ship, but the glory days of ocean liners are already over. Television programme maker Coen Verbraak interviewed people who made the lifechanging journey from East to West ‘The Oranje was our ticket to a new life. That ship represented freedom. The overwhelming feeling was: we’ve survived. […] The ship was moored there in the hot sun with the red cross on the side. That was our escape route.’ Dieter van der Schilden shares his memories of the Oranje. After the Japanese surrender and the ensuing Indonesian National Revolution leading to independence, the first of thousands of migrants set sail from the Dutch East Indies (presentday Indonesia) to the Netherlands. An estimated 300,000 people made the voyage to their new home between 1945 and 1965. A few thousand of them travelled on the Oranje, the ship that changed the course of their lives. Especially for this exhibition, television programme maker Coen Verbraak spoke to ten people who travelled from Indonesia to the Netherlands on board the Oranje. These personal stories about leaving the land of their birth, their time on board, and their new lives in the Netherlands are told in a moving film. The film is screened as part of the exhibition, and powerful portraits of the individuals concerned taken by photographer Jitske Schols are also on display. For more information see: hetscheepvaartmuseum.nl/msoranje. Intriguing exhibition Sea of Tranquillity by Belgian artist Hans Op de Beeck Another exhibition, namely Sea of Tranquillity by the internationallyrenowned artist Hans Op de Beeck will also open at Het Scheepvaartmuseum on 8 September 2018. It portrays a mysterious and decadent imaginary cruise ship, dreamed up by the artist. The source of his inspiration for the installation was the shipyards of Saint Nazaire in western France, the birthplace of some of the world’s largest cruise ships. The mysterious Sea of Tranquillity will be on show at Het Scheepvaartmuseum until 9 June 2019. This highlyacclaimed exhibition has made its way around Europe, having previously been on show at museums in Belgium, France, Switzerland, and Spain. Sea of Tranquillity is an installation that immerses visitors in its own intriguing world. 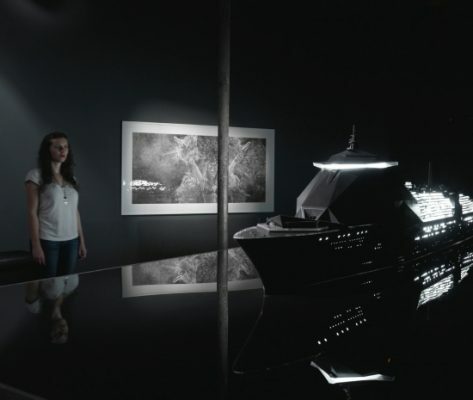 It features a fiction film with no dialogue and an exhibition including an illuminated model ship, lifelike sculptures, display cases, and furniture. It presents a mysterious picture of a mythical cruise ship. The atmospheric film draws in audiences, making them feel part of life on board a ship that doesn’t exist. For more information see: hetscheepvaartmuseum.nl/hansopdebeeck. Het Scheepvaartmuseum, housed in a beautiful historic building dating from 1656, shows how water brings worlds together. The museum showcases a wide range of impressive masterpieces and artefacts. Its collection is considered by experts to be one of the finest maritime collections in the world. In addition to exhibitions with a historical character, the museum also exhibits work by contemporary international artists and designers. The museum draws approximately 350,000 visitors every year, putting it among the top ten Amsterdam museums and making it a major attraction for both Dutch and international tourists.